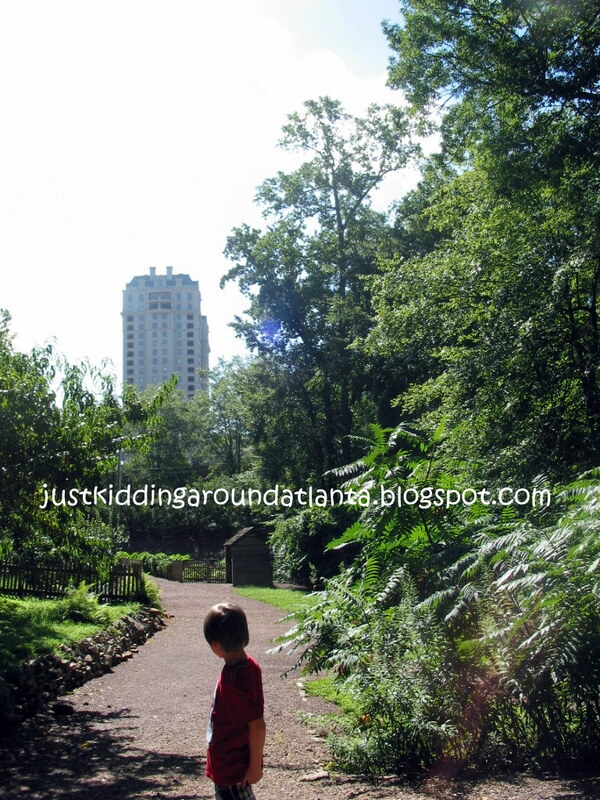 Explore, Learn, Have Fun! 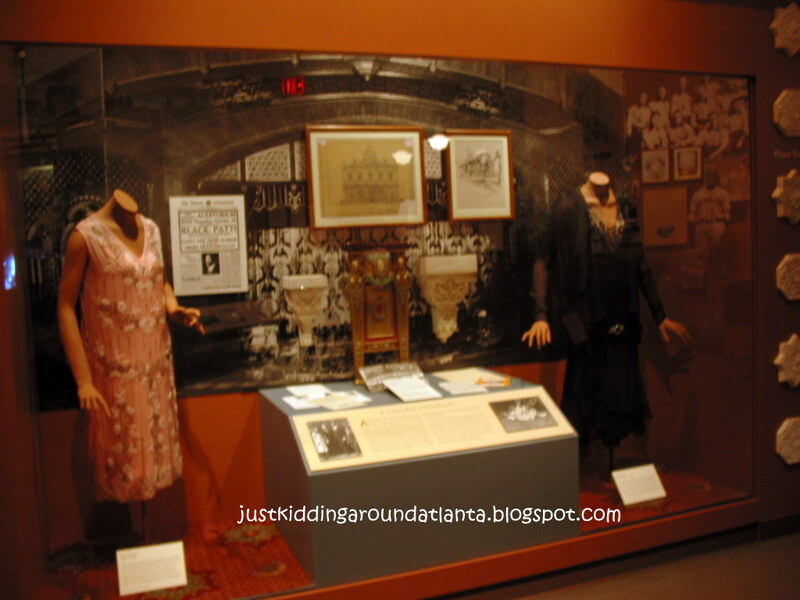 : Atlanta History Center Review/Giveaway for Atlanta readers!! 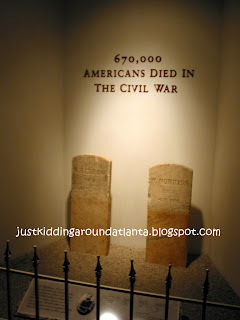 Atlanta History Center Review/Giveaway for Atlanta readers!! 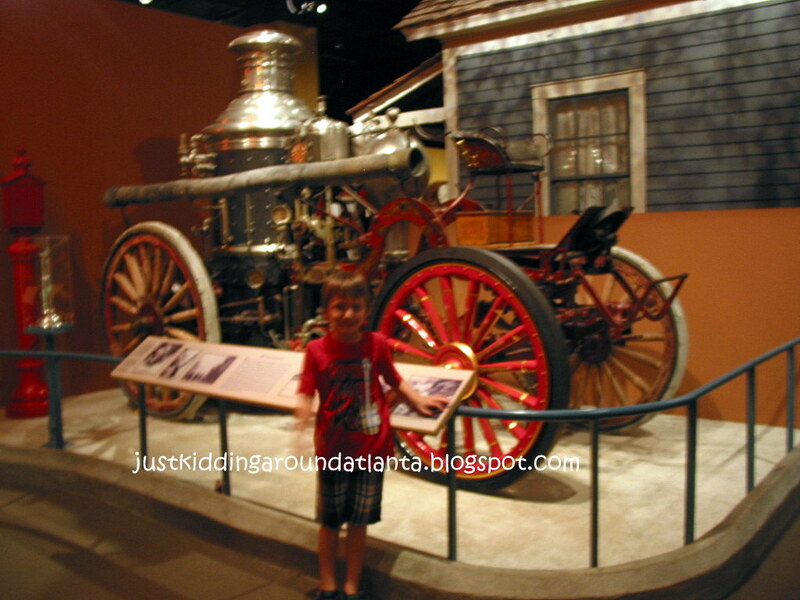 Nestled amid 33 beautiful acres in the heart of Buckhead you'll find a hidden gem ~ the Atlanta History Center. The largest history museum in the Southeast is a fantastic resource for Atlanta families! Not only can you visit many permanent and traveling exhibits inside the History Center, you can also tour several historic homes, walk through their many gorgeous gardens and take part in educational programs about our wonderful city. Randy and I took the kids to the AHC last weekend. I'm a planner, so the plan was to visit all of the outdoor places first, before it got really hot and steamy. If you visit in the summer, this is definitely the way to tour the Center! We all walked down to the playhouse first. 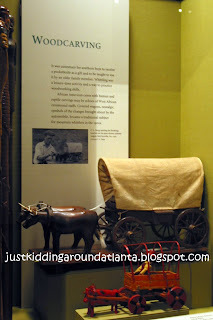 This is a favorite spot of mine at the Atlanta History Center, as Katie used to love that sweet playhouse when she was David's age! 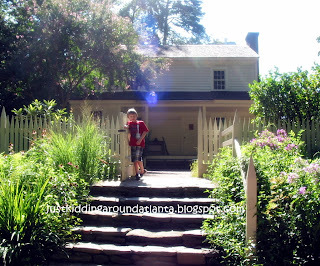 This was David's first trip there, and he enjoyed exploring the little white playhouse with his big sister. Then we walked over to the magnificent Swan House. Built in 1928 for the Inman family, it was designed by Atlanta architect Philip Trammell Shutze. If you'd like a glimpse inside the house to see what life in the 20's & 30's was like, sign up at the ticket desk for a free tour! After a few pictures outside and a peek in the windows, we headed to the Tullie Smith Farm, which meant a quick walk through some of the beautiful gardens behind the AHC. The farmhouse is quite historic. 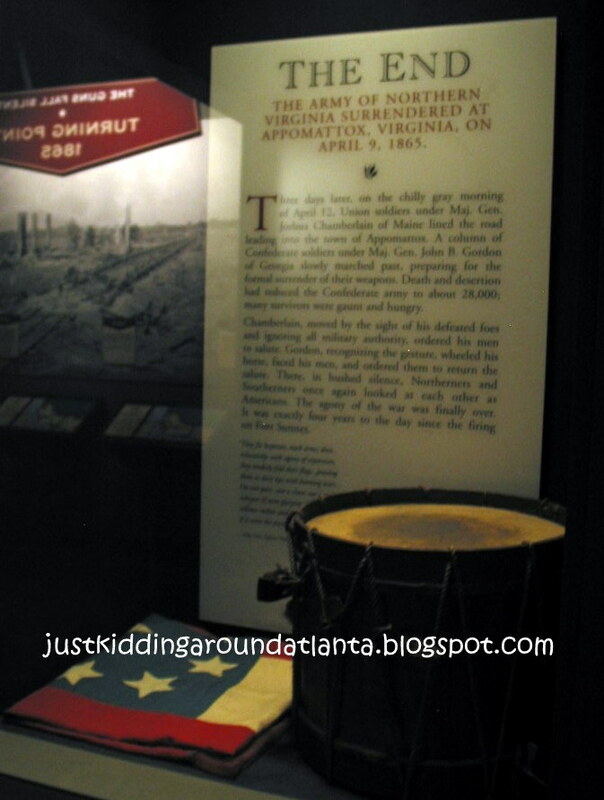 It survived the burning of Atlanta in 1864, and was later moved to the Center from east of Atlanta. You can sign up for a free tour of the farmhouse at the ticket desk. We didn't take the tour this time, opting to walk around the farm on our own, admiring the beautiful flower gardens and looking in the various structures. These include a double corncrib, a blacksmith shop, a smokehouse, an open-hearth kitchen and more. It's like stepping back in time! It's almost surreal to scan the horizon - on one side you see this old-fashioned farm and on the other side, skyscrapers! In September, make plans to visit the Farm for the annual Fall Folklife Festival. There will be hands-on crafts, a petting zoo, storytellers and more, plus demonstrations of traditional folk arts. By now it was getting hot and sticky - typical weather for Atlanta in July! 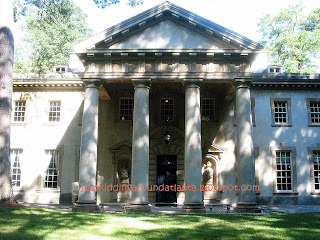 My husband headed to the Kenan Research Center next door to do some research on his favorite Southern authors, while the kids and I went back to the AHC. Ahhh - cool air conditioned air! 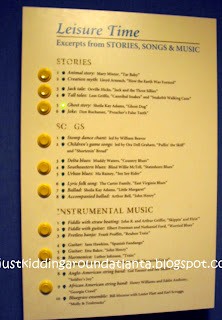 Our first stop: Atlanta's Book: The Lost Gone With The Wind Manuscript exhibit. 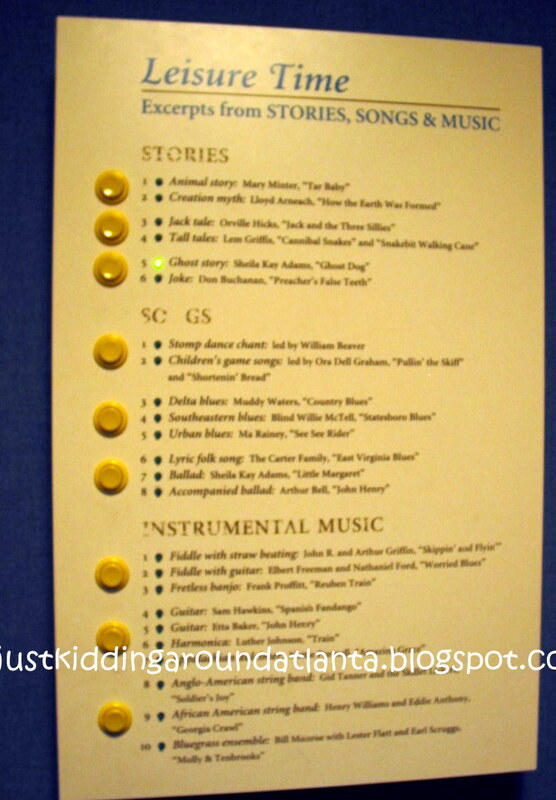 I'm a huge GWTW fan, so I was really happy to have the opportunity to check this out! It's been 75 years since the publication of this novel, and the AHC is one of only two venues displaying chapters from the original manuscript! You'll see foreign editions of Gone With The Wind, first editions, correspondence from Mitchell to fans, colleages and friends, images and more. As mentioned before, the highlight of the exhibit is the last four chapters of the book, including one entire chapter, page by page, posted on the walls. They include handwritten changes from Mitchell and her husband - what a treasure to see! The desk she used to write the book is on display as well. The kids and I really enjoyed this exhibition! It will be at the AHC through September 5. By the way, the Atlanta History Center also owns and operates the Margaret Mitchell House, located a few miles away in Midtown. For a few dollars more, you can purchase a dual ticket that includes both the Atlanta History Center and the Margaret Mitchell House - just inquire at the ticket desk when you arrive! David wanted to see the golf display ~ Down the Fairway With Bobby Jones. 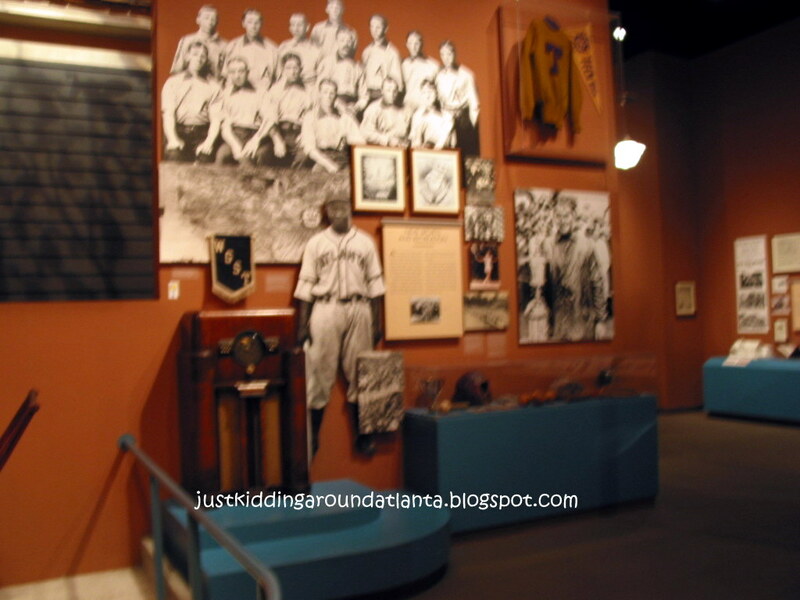 While it focuses on the life and golfing career of Bobby Jones, it also includes the history of the game of golf. David liked the trophies and the mannequins dressed in their golfing best! 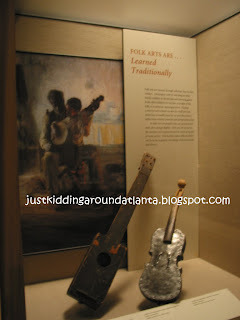 Next, we visited The Goizueta Folklife Gallery, which is home to Shaping Traditions: Folk Arts in a Changing South. This is a very family-friendly, hands on exhibition. My kids enjoyed the two rooms created for listening to traditional songs, hymns, and stories. 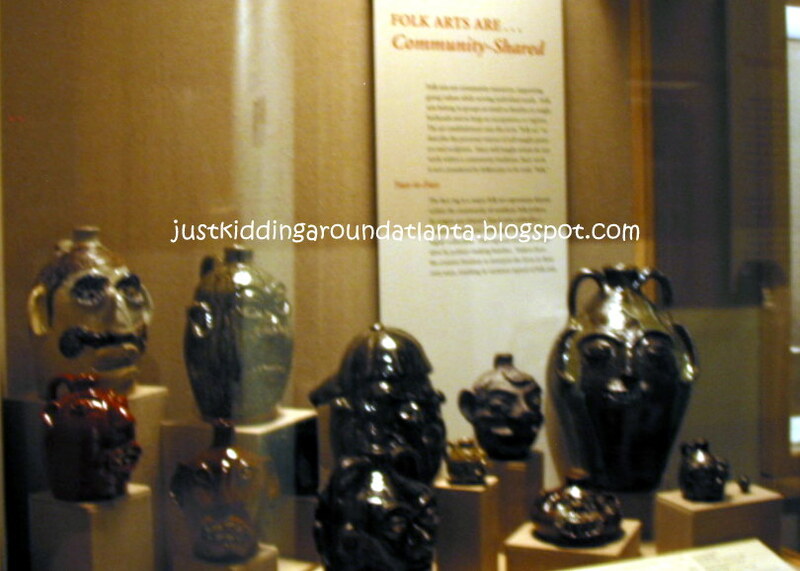 In addition, there are so many folk arts to see: quilting, wood carving, musical instruments, baskets, needlework, even face jugs - something Randy and I both love and hope to collect one day! 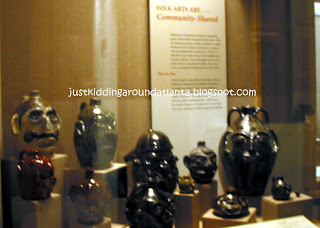 LOVE the collection of face jugs - some of my favorite things! 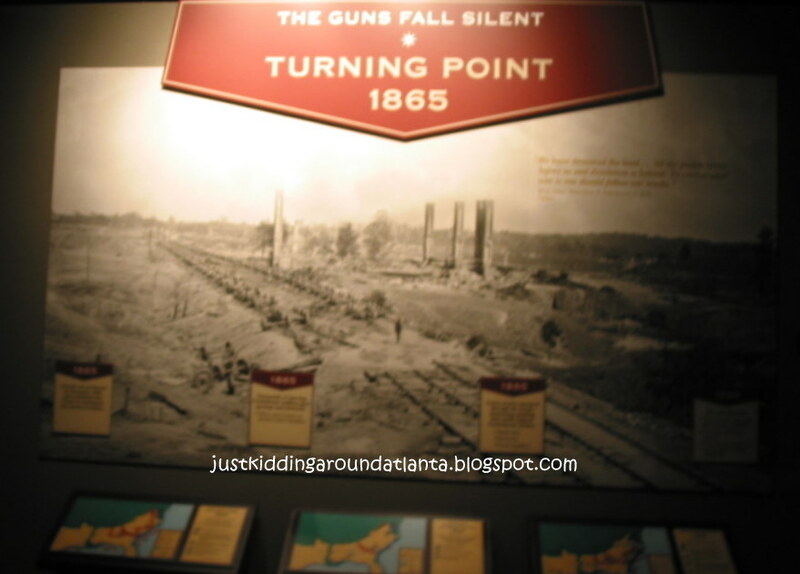 In the DuBose Gallery we spent time exploring Turning Point: The American Civil War. 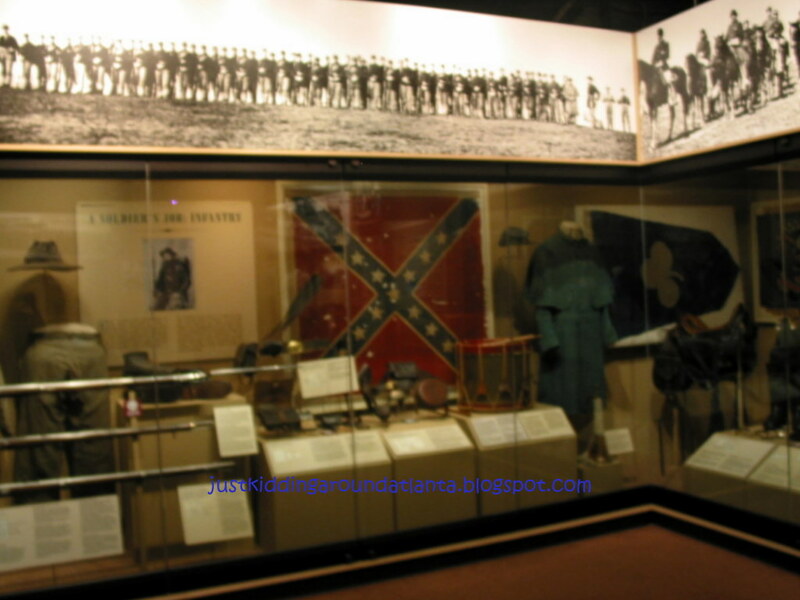 It is one of the nation's largest Civil War exhibits and has a huge collection of artifacts. You can see the Confederate Flag that flew over Atlanta at the time of its surrender, a huge collection of firearms, uniforms, medical equipment and other everyday objects the soldiers used, and more. It's a fascinating, yet moving look into this troubled time in our nation's past. 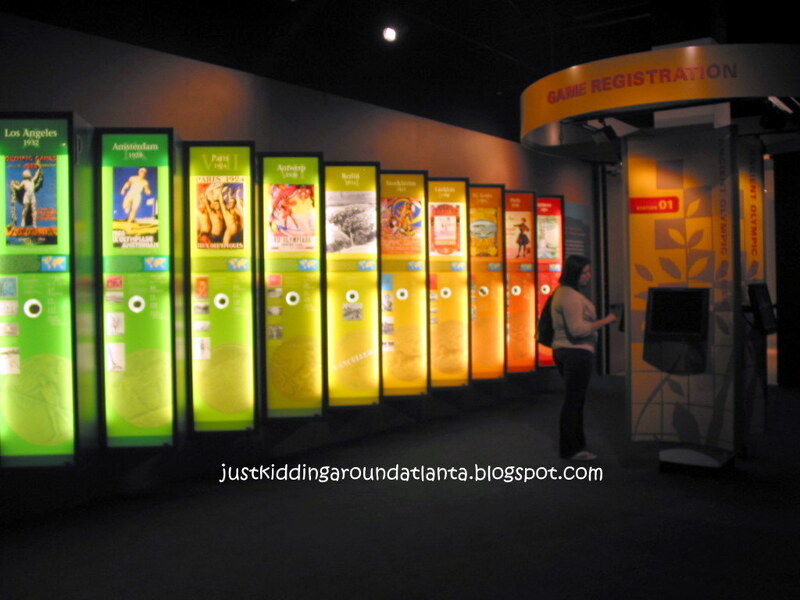 There are interactive stations and videos to check out, too. Your kids will enjoy exploring this 9200 square foot gallery - there is so much to see and do in here. David was really fascinated by this statue, taking several pictures of it, and lingering beside it until I persuaded him to move on. It depicts Lt. Hamilton M. Branch, a veteran of the 54th Georgia regiment and the Atlanta campaign. He was supposedly wearing his old uniform, which is one of the ones displayed in the nearby case. It is an approximate copy of the statue atop the Confederate monument in Forsyth Park, Savannah. 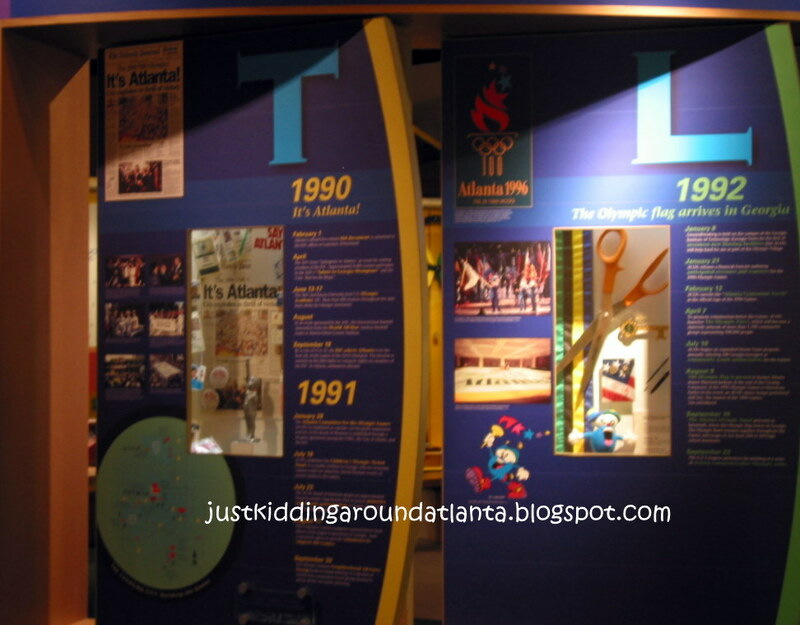 The biggest hit with my kids was the Centennial Olympic Games Museum. *So. much. fun! 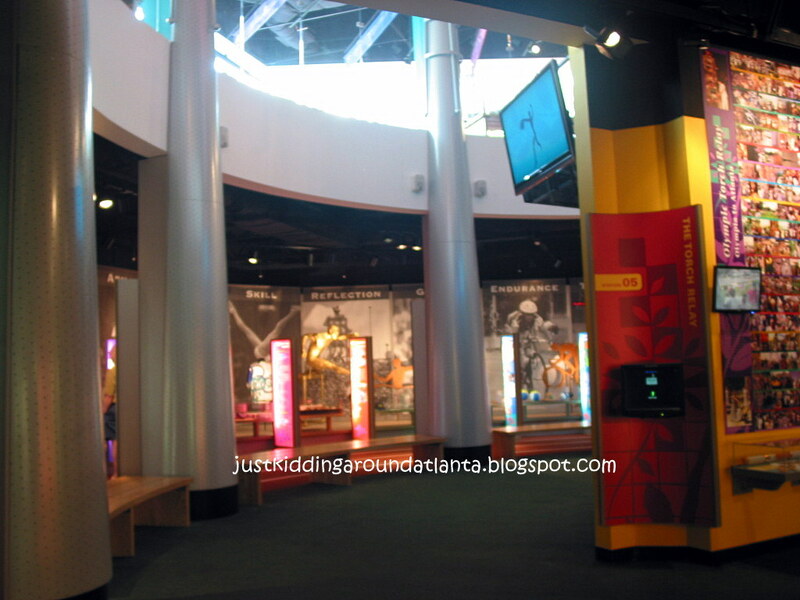 * This brightly-colored, high-energy museum tells the history of the Olympic Games and details Atlanta's journey to hosting the 1996 Centennial Olympic Games. I still remember the day it was announced that we won the bid to have the games here ~ "It's Atlanta"! ~ our whole city celebrated! 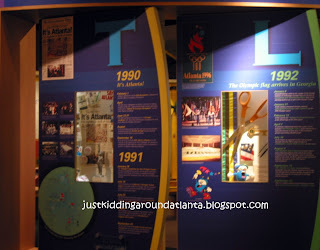 The Olympics were such a HUGE deal in Atlanta and it is so cool to relive that excitement all over again in this museum. There is an interactive trivia quiz that has 12 stations throughout the museum, and my kids enjoyed challenging each other to see who could answer the most questions correctly! 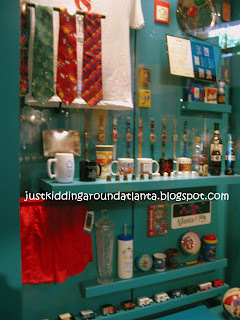 I loved seeing the collection of memorabilia from the 1996 games, too! 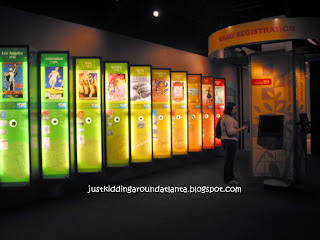 There are so many things to see, read, and do in here ~ it is an absolute treasure for the citizens of Atlanta! Another fun exhibition is Metropolitan Frontiers. It shows Atlanta's humble start as a rural region, then as a transportation center, later a commercial city, and finally a sprawling suburban metropolis. There are so many fantastic artifacts from the past to see in here - an 1879 log cabin, an 1894 shotgun house filled with period furnishings, beautiful vintage clothing, vehicles, videos to watch, vintage photos to look at and more, more, more! 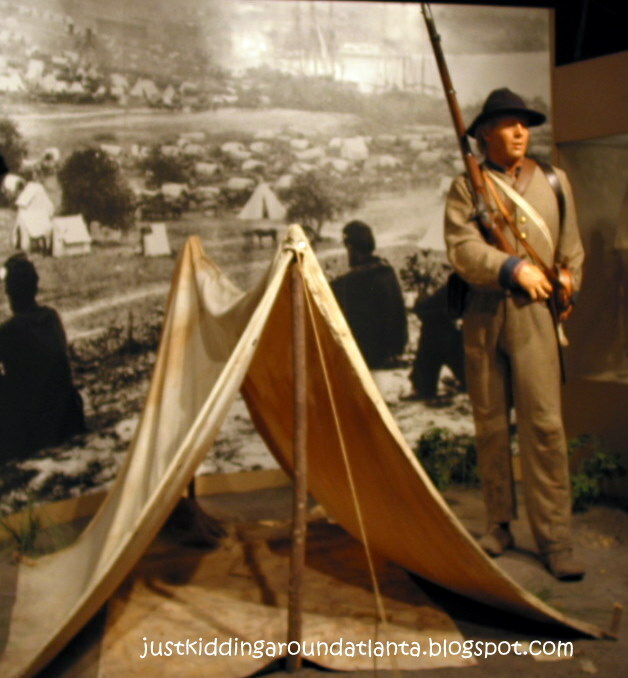 Our last stop was War In Our Backyards: Discovering Atlanta 1861- 1865. By the time we got here, my camera battery had died and my kids were getting a bit whiny for lunch. I didn't get to see as much of this exhibit as I'd have liked. It was interesting to see maps of Atlanta before and after the war, to see how much of our beautiful city was actually destroyed by Sherman and his troops. There is even a 3-D video slide show to watch - wow! This exhibit is at the AHC through October 7. Finally, no trip to a cool place is complete without a visit to the Gift Shop, right? The AHC Gift Shop doesn't disappoint! My husband discovered a book he really wanted about Blues singers on the sale shelf. There were also beautiful pieces of jewelry, fun Christmas ornaments, plus lots of books, games and plenty of kid-friendly items to be found. So make sure you stop by the Gift Shop before you leave the Center and find a little souvenir to take with you! If you are hungry, check out the Chick Fil A Coca Cola Cafe downstairs, or enjoy lunch or afternoon tea at the Swan Coach House, just a short walk from the Swan House! 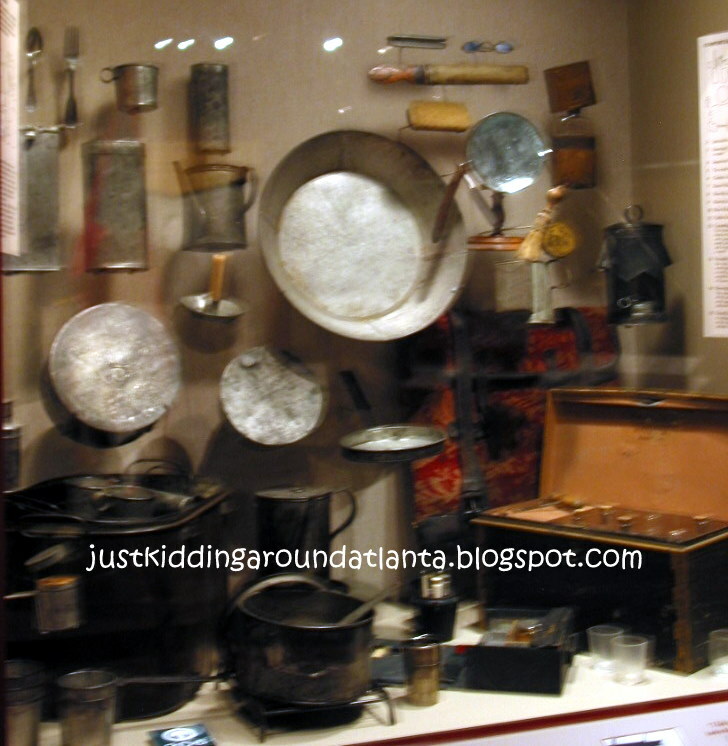 As you can see, the Atlanta History Center is packed full of exciting things to see and do. Much of it is hands-on, kid-friendly fun. All of it is interesting and educational. You'll learn how Atlanta has transformed from a sleepy rural community into the metropolis it is today, including the not-so-pretty parts of our history. 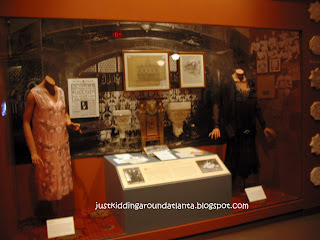 Believe it or not, there are still more exhibits that I didn't get the chance to see while we were there! You could easily spend several hours exploring the Center, or even a full day if you want to really take your time and see it all! Whether you live here already or you are planning to visit our city, please find the time to visit the Atlanta History Center! 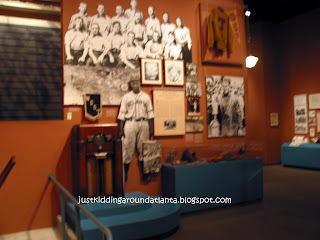 The Atlanta History Center is located at 130 West Paces Ferry Road Atlanta, GA 30305. The Museum is open Monday - Saturday 10 am - 5:30 pm. Sunday 12 pm - 5:30 pm. Their website is here. Find out about different membership options here. 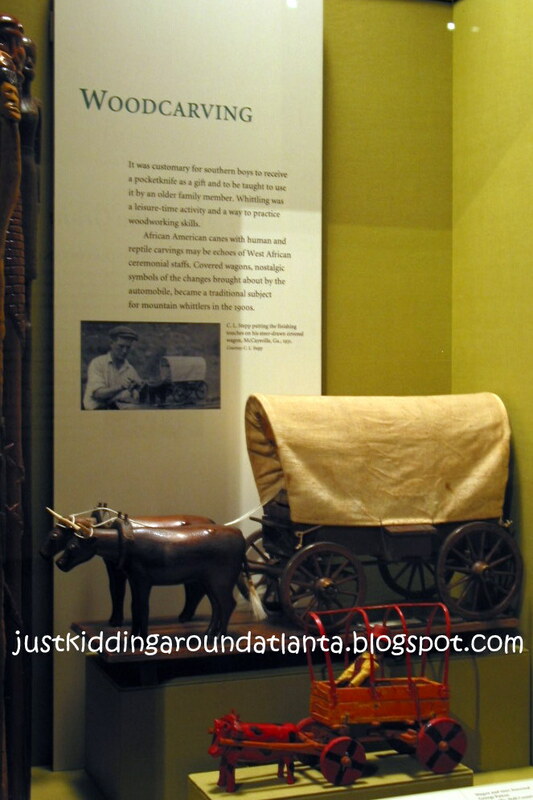 The Margaret Mitchell House is located at 990 Peachtree Street, Atlanta, GA 30309. Their hours are the same as the AHC. The website is here. 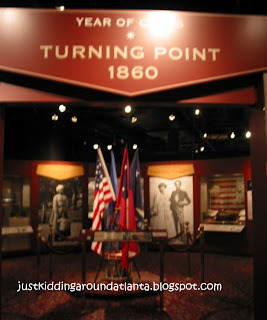 Follow the AHC on Twitter, send them a tweet saying "@ATLHistCenter, @justkiddingaroundatlanta.blogspot.com sent me for AHC giveaway", then leave a comment here saying you did so. (If you don't have a twitter account, just leave a comment here saying so to count as your 2nd mandatory entry). Follow JKAA via GFC, (box in right sidebar) then leave a comment saying you did (or already do) with your GFC id. Follow JKAA via Twitter, leave a comment saying you did with your twitter id. Sign up for JKAA's email newsletter via the box in the sidebar, confirm via your email, then leave a comment here saying you did. Like JKAA on FB, leave a comment on the wall, then leave a comment here saying you did, including your FB id. 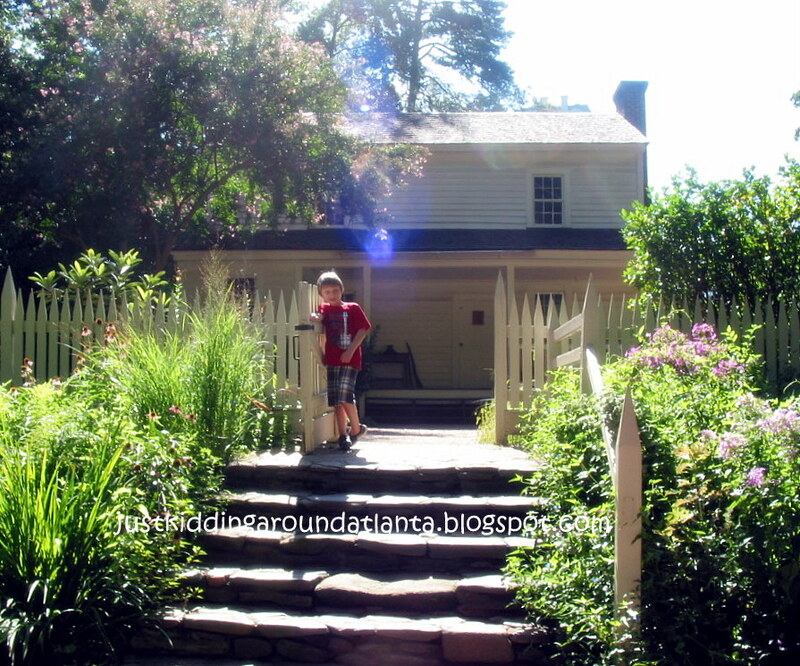 Like the Margaret Mitchell House on FB, leave a comment on their wall saying justkiddingaroundatlanta.blogspot.com sent you, then leave a comment hear saying you did. Disclaimer: My family was given a family pass to visit the AHC for this review and two additional passes to give away. No other compensation was provided. 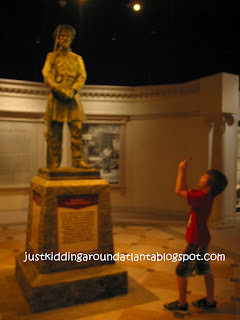 The opinions stated in this review are completely my own, and were not influenced because we received free admission - if we had purchased tickets I would have felt the same way about the Atlanta History Center! I did both of the mandatory entries! I Signed up for JKAA's email newsletter! I Like the Margaret Mitchell House on FB and told them you sent me! Great info. Thanks for sharing. I liked their page on Facebook as well. I like AHC on FB. I think the drawing for tickets is a great idea for a family outing. Thanks for all of the helpful information. I liked the Atl History Ctr on Facebook. My nephew will be in town in a couple of weeks. He was born and raised in the ATL. He is bringing his two young daughter's in from Cocoa Beach, Florida. The AHC will be a fun outing when they are here. Thanks for the tips. Hi, I did both mandatory entries. Here is the link to the tweet too. Hi Elisabeth!! I am SO glad y'all had a great time at the Atlanta History Center! : ) I hope you will keep entering contests here on my blog- I have more planned for after the first of the year!! Merry Christmas! !